Cheers mate 1 owe you 1 or 2 thanks just hope it don't go bang we're do you get the power supply from ? That's good news can't wait to get it fitted ? All I need is a wiring diagram and what wire to get ? Noticed you have no top hats at rear end got a spare 1 if you want it ? All I need is a wiring diagram? what wire to get ? I had a load of 3A rated wire hanging around so I used mostly that plus the handlebar switch/indicators are all the original cabling. That box you see in the picture is my first (and only) project box which needs to remain on the C5. Its got loads of extra holes in it[woot]. I still haven't worked out where I'm going to put the relay. Inside the box theres not much room, and on top of it is where its going to stay for now. 2 frames and an axle what other bits you got ? 2 other C5s and not much else. A bunch of original (worn-out) tyres from the C5s. Oh, and a Zike & Indicators that's currently on Ebay. Yeah they'd be useful, how much? I do have 1 set to go between 3 C5's but I don't usually have them on the C5 when I go out as they just come loose and vanish if I'm not careful. Cool, glad it got back to you okay. Both arduinos have the software on them, so no need to upload anything. 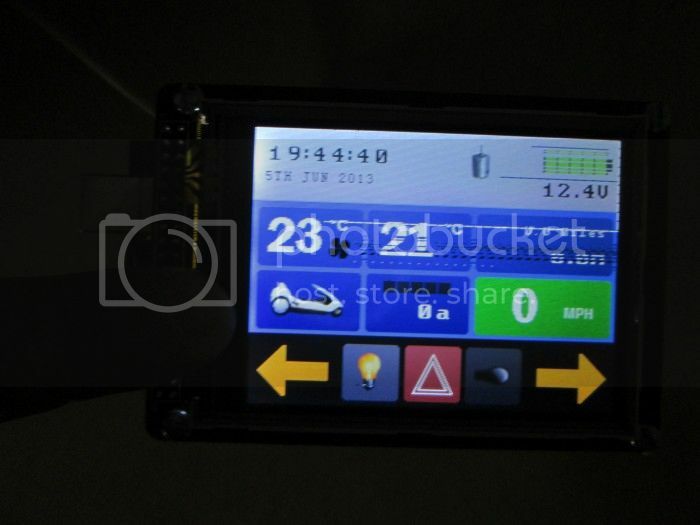 Thinking about the 24V version, you could do a quick mod on the current one whereby the motor is no longer controlled by the control box but is instead wired to the uni8, like you've got yours now, only feed the ground into the current sensor first and then into the uni8. And feed a 12V supply to the control box so all the lights, sensors etc work. 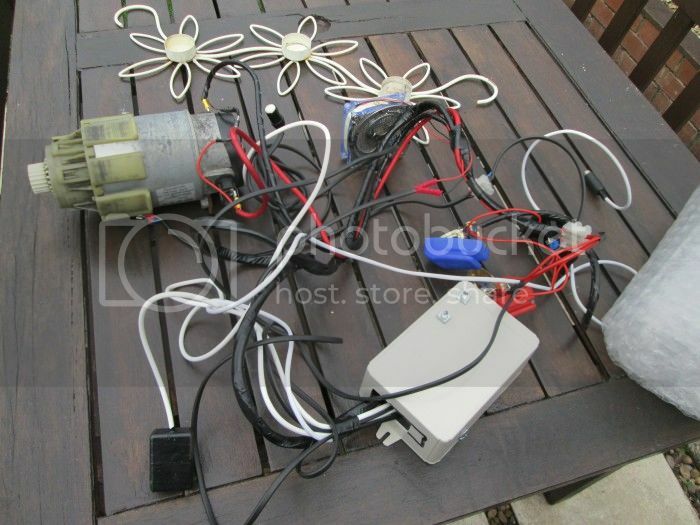 One of these can be used to convert the 24V into 12V. 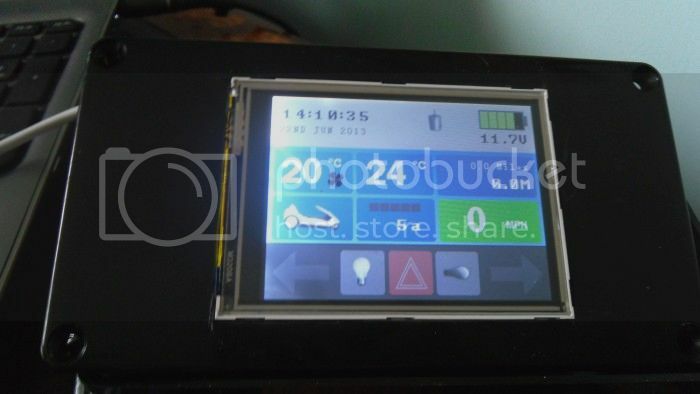 The only thing with the above is the voltage meter on the screen would obviously be wrong and the control box cannot stop the motor from being used. 24v touch ? Is there a pin number code on this soft ware ? Is there a pin number code on this soft ware ? There was, it's been disabled until I get around to fixing a couple of bugs with it. I use the 12V C5 when I'm on public roads so no need to worry about that. The 24v will only be for private land etc. Got the current sensor how do you wire the + - s on the module there's vcc bnd out ans sence ? The reed switch as not come yet got a small pfoject box for it so it can be closer to the magnet The jumper leads no going to use alarm cable ? Yip not far of now need to go to halfords tomorrow and get the fitting for the relay can I use the led bulbs that are on the shop side of the site ? 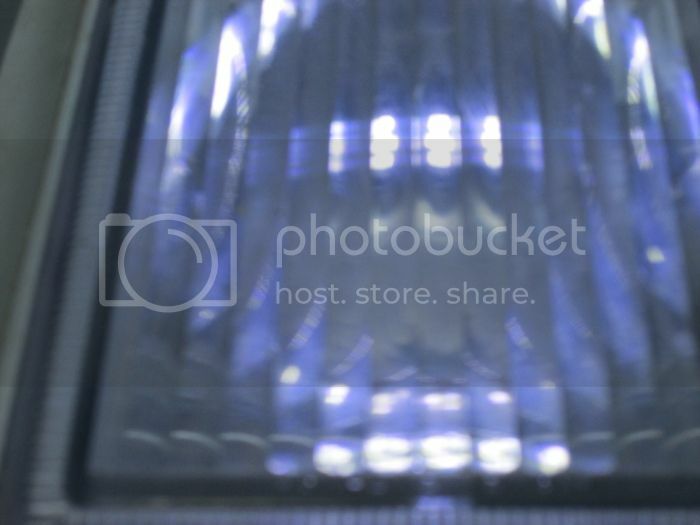 can I use the led bulbs that are on the shop side of the site ? So if I'm right in what u said ? I could just put the current sensor on the - wire on the uni 8 and take a feed from 1 battery to the control. Box and it would work ? But tbe uni 8 as a cut off I think if it gets to warm ? 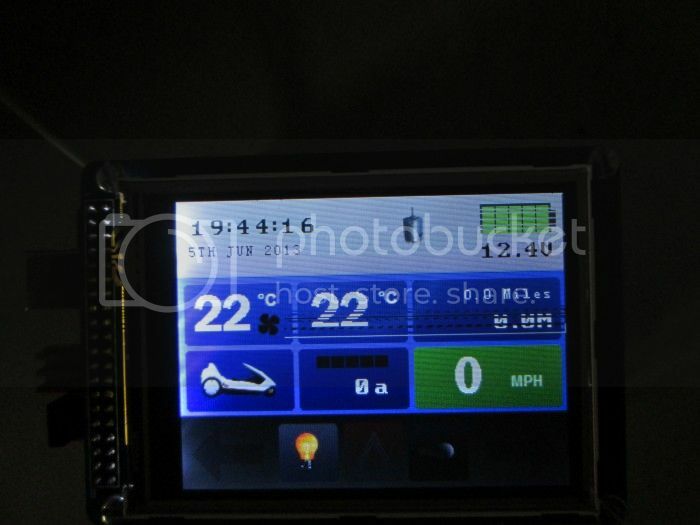 By the way from the battery is forward going to current module and wen is this going on ebay ? So if I'm right in what u said ? I could just put the current sensor on the - wire on the uni 8 and take a feed from 1 battery to the control. Box and it would work ? But tbe uni 8 as a cut off I think if it gets to warm ? 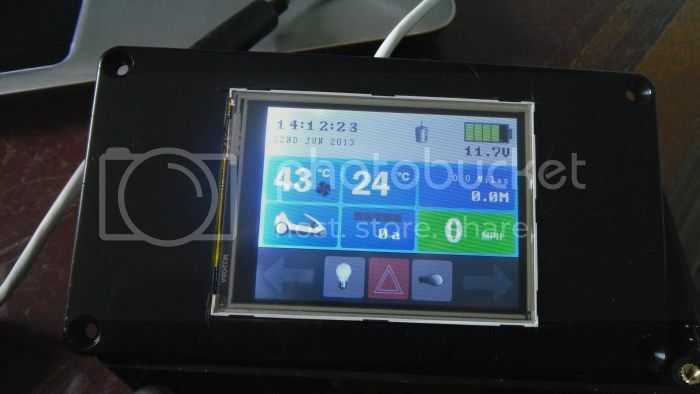 By the way from the battery is forward going to current module and wen is this going on ebay ? You means this touch board going on ebay? Can't do that, I only have one board left and that's for Marra which I'll send to you when you've completed you're own. Dan from the relay on the board + - which gos to 86 85 ad from current sensor to relay is it 87 or 30if its 87 - 30 gos to motor - ? Cheers mate on the current sensor is it battery to forward on the module ? And will 5 amp cable be ok for battery - to the battery in on the board and for + on the board ? And 10 awg cable for the wiring ? Cheers mate on the current sensor is it battery to forward on the module ? And will 5 amp cable be ok for battery - to the battery in on the board and for + on the board ? Yep, battery to the forward, 5 amp cable to power the PCB is plenty. And 10 awg cable for the wiring ? Yep 10 awg is fine. On the wiring kit do you meen a on off switch ? Who have you put on yours ? Mine runs through a relay/switch, like Chas's safety wiring kits do. Or you can just ignore it and connect straight to the battery, it's up to you. Was thinking about using a light switch and bracket on the 5. 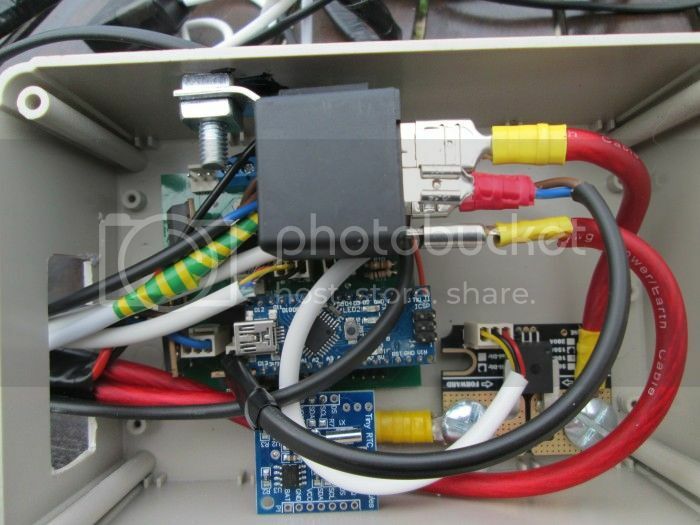 Amp power supply going to control box to turn power off and on ? Yeah, doesn't look like it. Have you chopped your pod up? What state is your C5 in, ready to fire it all up yet (or will it go up in flames when you turn it on )? Yep that sounds like a good place to put it. I found on mine they reed had to be very close to the magnet , but maybe my magnet isn't that strong The software has the reed stuff in it for calculating speed/distance etc. I will be making a few changes to the software at some point so if you want to apply any software updates in the future its advisable to keep a long usb cable attached to the nano and store it under the seat so you don't have to disassemble you're project box to get at it. For the display box, I've put an extra hole in it so I can see the MEGA's usb socket, again, saves me pulling apart the box to apply software updates. What state is your C5 in, ready to fire it all up yet (or will it go up in flames when you turn it onCrying)? its good mate using my 24 v one hope your jokin about going up in flame ? For the display box, I've put an extra hole in it so I can see the MEGA's usb socket, again, saves me pulling apart the box to apply software updates.mine as a 4 pin plug on mate so will be easy to take off ? Nah it'll be fine, though I hope you know what you're doing with using 24v on it. As long as the control box just gets 12v it should work no probs in theory and the current sensor can handle 24v. Cool that's great to hear. 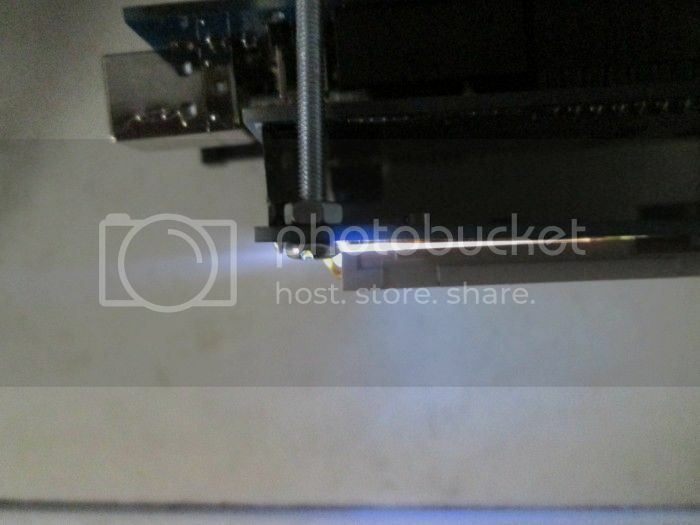 About the current sensor, if you've double checked the wiring and it all looks okay but it still doesn't work, you can post it to me if you want and I'll test it here. The fan should come on at 25°C. 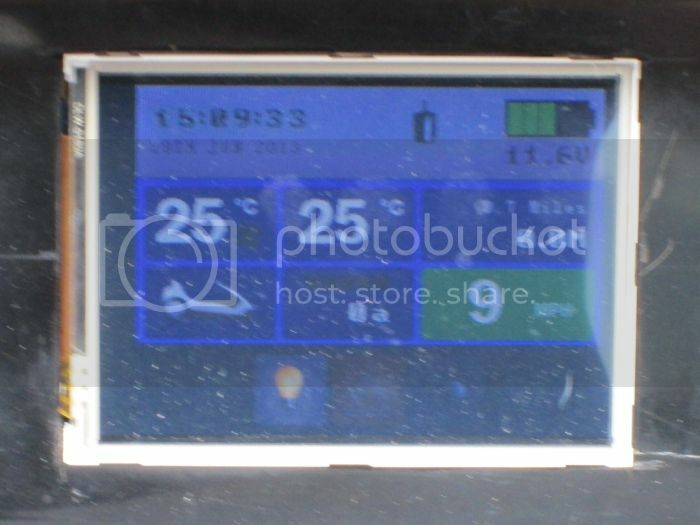 In the top left of the screen is the motor temp. Is this updating correctly? So when it reaches 25°C the Black fan icon should start to spin around indicating the fan is on. There's not much that can go wrong with the fan wiring, just double check you've got the + & - wired the right way around as with brushless fans the polarity matters. If you've got a heat gun can you get it to 30°C and see if it still won't come on? 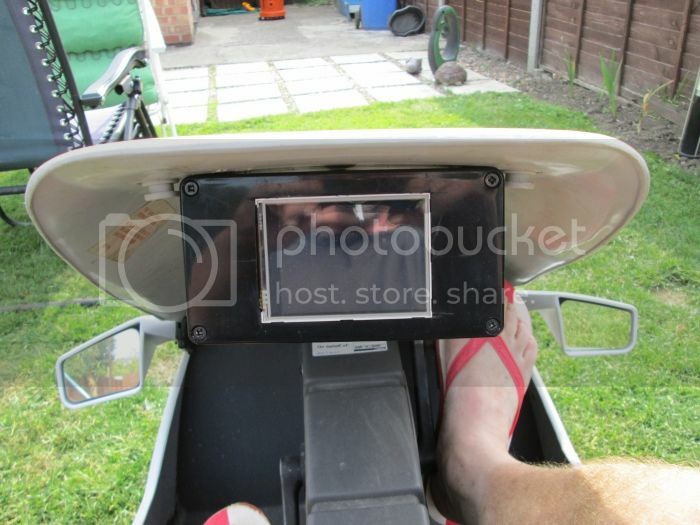 The White screen plastic is a strange one, I've had 2 of these screens and they both work okay, yours maybe a bit duff? You shouldn't have to push it down. You could try and ask the ebay seller if you can return it? Yeah, that's the best place I could think to put the options screen. So you've set the PIN and then forgotten it??? 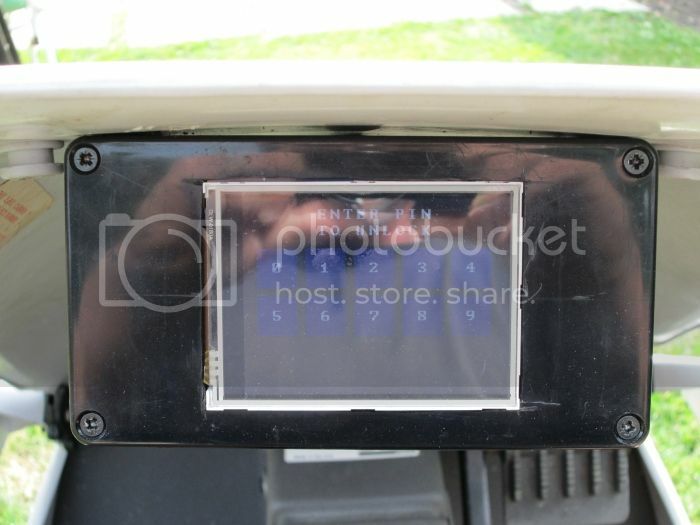 If you know you're PIN then to disable it, go to the set pin screen and set the PIN to 0000 and that will disable it If you've completely forgotten the PIN the only thing you can do is pull the battery out of the RTC, wait a few seconds and put the battery back in. This will reset the PIN to disabled and the time/date will also need to be set again. What sort of fan are you using? 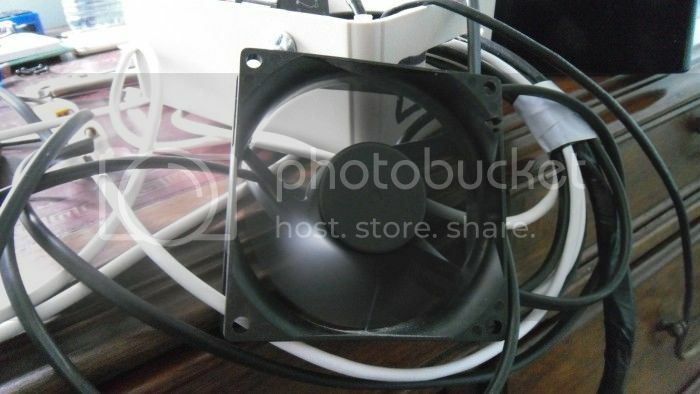 A regular PC cooling fan? When we go 24V with this thing, the uni will probably end up on top of the control box so, thinking ahead, I stuck the relay there to make it easier on the wiring. If you think of anything else to make this touch thing do that'll make it better then let me know. I've been thinking of adding a fingerprint scanner rather than a pin code and also, perhaps add an accelerometer too and a gps tracker which I could use as an alarm if the C5 is stolen and used outside of a given area. Lol what about a mp3 player on the screen ? Using the sd card ? Yeah, I think if I want music on the go I'll stick to an iPod The SD card is reserved for data logging. why are we going 24 v with this thing ? whats the next project ? lol not fitting till i get a pod not cutting a working pod up ? and the 1 on ebay is to dear ? why are we going 24 v with this thing ? Didn't you want it to work on your 24v c5? I'm having a break from C5 stuff, will probably make a game or something. not fitting till i get a pod not cutting a working pod up ? and the 1 on ebay is to dear ? Yeah I've not got any spares. 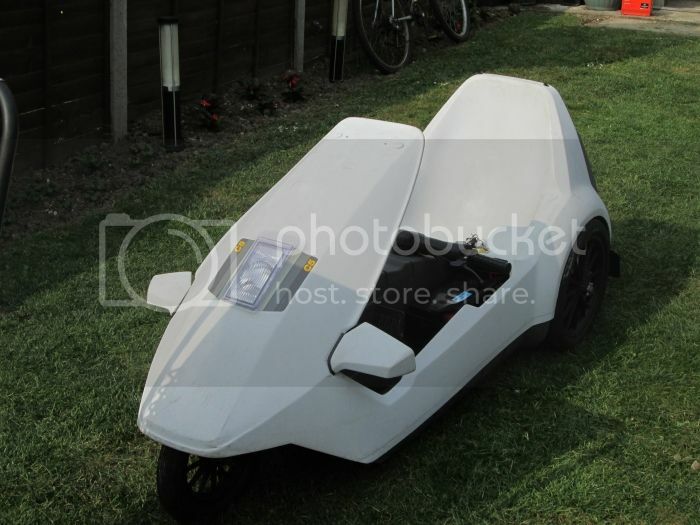 Is there no other way you can think of to attach it to the c5??? Not ad time today been busy look at it tomorrow ? The total av too work it out ? As ebay nope lol looki ng 150 quid but got extra bits like solder and new tip and 4 pin plug and project box for reed so its about 120 -130 to make ? 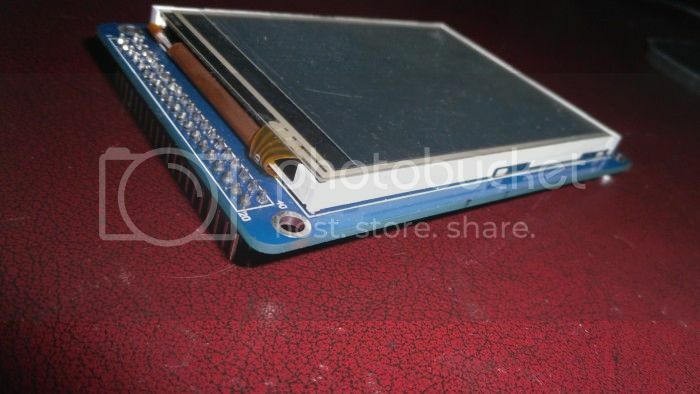 on your screen is there two metal strips that holds the white plate to the pcb mine only gos to 2 clips and there's 3 it stops just after the second 1 in the middle ?think that's y its coming up ? Hi Dave, After taking mine off and having a closer look mine lifts slightly on the left side, but only very slightly, here's some pics from both sides: I don't have a problem with the backlight though. Is that whats wrong with yours, the backlight is dark at one end? Post some pictures of it if you can so I can see what you mean? Yeah, at £130 is it really worth doing? I think so. I use my C5 quite a lot and I imagine, if I continued to use the POD it would sooner or later stop working, or something in the control box would blow. And I like being able to see how far I've traveled and the temp. of the motor etc rather than just a bunch of LEDs and a beeper , so for me, it's worth it. Good stuff, your box looks cramped like mine The screen looks ropey, shouldn't have those black lines on it. 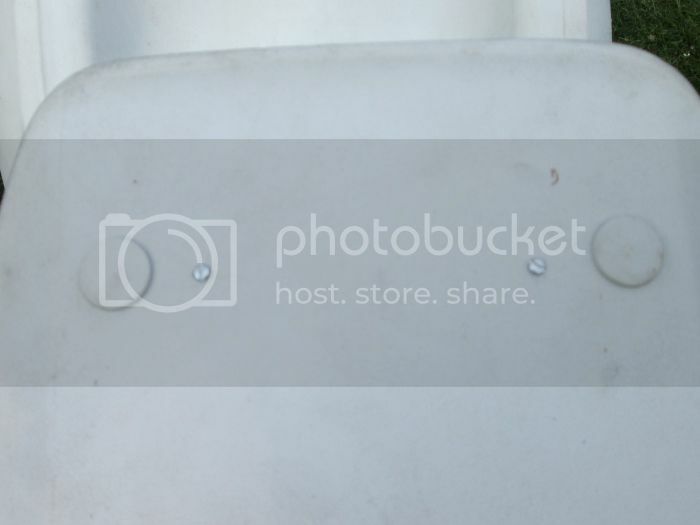 As your box has got the plastic bits sticking out to bolt it to something, does it fit the existing plastic inserts that a normal control box would be bolted to? One last thing, you said there were no current readings when you used the motor? 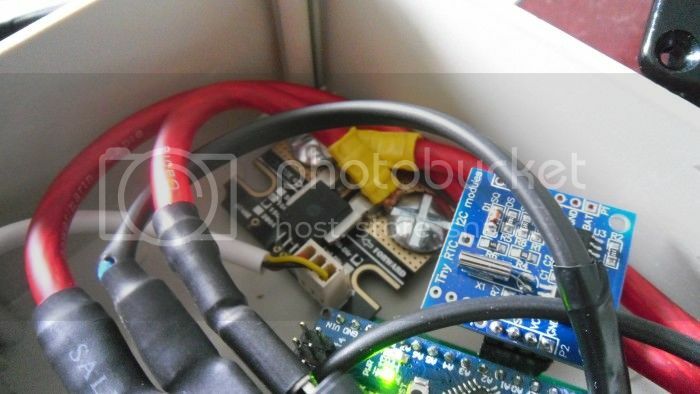 Just checking that the wire in your picture, going to the "Forward" terminal of the current sensor is coming from the battery? 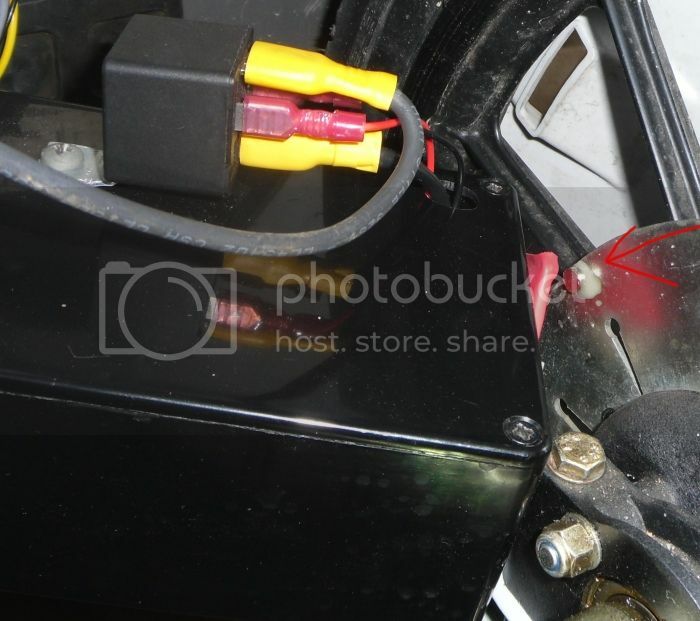 the box as 2 lugs on the lid and will just go in the fitting holes on the frame and forward to the battery and rev to relay have to look at the wiring on the sensor looks like screen is buggered looks like ill av to get another 1 ? where can you get the strips to hold the fan from ? You'll have to tell me where you got the box from, I may put mine in one. Don't you have a fan already on you're 24V c5? I used some Meccano strips, cant remember where I got them from or how long they were originally but something like these or maybe a bit longer. I'll be sending Marra's board to you tomorrow, did you want me to include a screen I've got hanging around? When you get Marra's board I've cut the 2 tracks on the PCB that go to VIN on both arduinos, you'll need to solder a wire underneath to connect the two. Hi Dave. sorry to throw a rotten bone but you may want to extend the heat shrink wrap over the terminal crimps. This will prevent a short if any debre or loose terminal comes off, could burn and totally destroy all you have achieved . thanks bud. Did you have to send the old one back? I was wondering where you're at with you C5, if the fan and current module is still not working?? Took it to 30 still no fan will have to take it apart and check the wiring ? 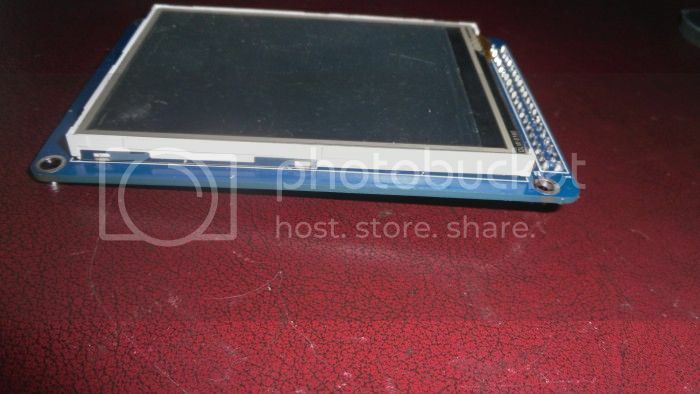 Dont know if I have to send the screen back I'll have to email the seller to find out ? Took it to 30 still no fan will have to take it apart and check the wiring ? Can you take the fan off and double check it works straight off a battery? And maybe plug something else into the fan connector on the PCB (like a 12V light) and see if that comes on when the temp. goes above 25? Right then Dave, got your control box. First, the fan doesn't seem to work when connected to the board, I think it may be to do with the PWM signal the arduino uses to vary the fan speed. So I've disconnected yours and put one of my spare fans on and it all works okay. 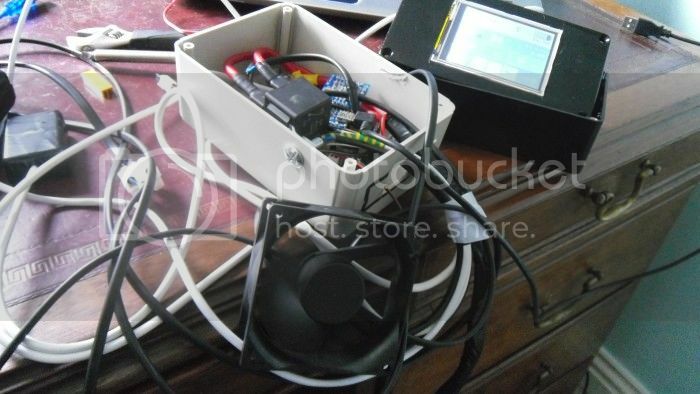 Next, the current sensor. I think I told you to wire it the wrong way around It should be battery to reverse and forward to the relay, not to worry, getting it the wrong way around doesn't damage anything. So here's some pics of it the right way. I was testing it on a bare motor (no gearbox) so the amp usage was very low. Should be much higher when back on the C5. I'll get it boxed back up and sent to you Monday (I've missed todays post). A couple of things to note. When I got the package the RTC battery seemed to have come out and was rattling around in the box. Also, the heatsink on the arduino mega had come off and too, was rattling around your screen box. I haven't put the heatsink back on, it's in the box. I used normal super glue last time (which is a bit of a no no for heatsinks) to fix it on, not sure if we need to use something stronger? Cheers mate owe you 1 got a new fan in the shed atleast its working now saw some 2 part glue that you mix up in poundland yesterday could try that ? Cheers bud what else could you use to hold the heat sink on ? Did u like the idea of the reed switch in the project box so its closer to the magnet ? Next question how do you configure this with the magnet ? I've put mine in the grooves on the tin plate on the brake side as far as it can go to the rim on the wheel ? I did like the reed switch in the box. Not sure if you'll need a strong magnet to make it work though... Yeah my magnet is just glued to the metal plate, the reed pcb is inside some heatshrink tube and is bolted to the right side of the main box about 1cm away from the magnet. Yeah, well if you only use the 24v one, no need for a 12v one! You were right about that screen, the light is all at one side and the lines keep appearing when you touch it, keep hold of it as a spare for testing. The beauty of the plug on the wire for that the screen only need 1 screen for 2 setups just saved 40 quid lol forward thinking ? And I didn't no about the 24v then ? Is there not heatsink glue or compound you can use to stick the heatsink down ? Hi Dave, Here is where I have put the magnet: It's right on the rim of the metal plate, the reed sensor is on the right side of the box, less than 1cm from the magnet. Nice one Dave, looking good Glad to see the finished article. I'll try to get your board done tomorrow or Monday then you'll need to get your self another C5 right for that (24v touch)?? Well Dave, with the new board it doesn't matter what you give it 12v or 24v (the board itself runs on 12v all the time), the board will just work. You would of course need the handlebar switch/relay in the control box for the 12v side of it but I cant see why it wouldn't work. You would just need to reconfigure the connections to your batteries and the motor (either relay or uni). There are 3 connections needed for the 24v board, GND, 12V & 24V. So to make it work on 12V you would just give it GND, 12V & 12V and it should all just work. So yeah 2 in one, I don't think I will try that, but you can give it a whiz when you get your board back? Cant do that the reed switch is a digital input, the current sensor needs an analog input. 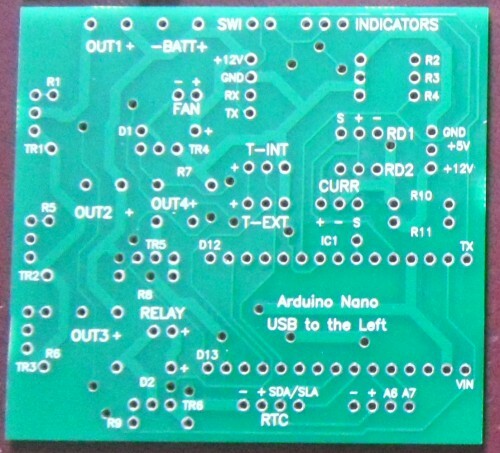 There are 2 free analog holes on the board under the RTC for connecting other analog input devices.